Not sure I have seen this feature request anywhere but as a designer, I heavily use this feature. I know you can create styles but it's not the same feature and not as fast as copy/paste. All the effects applied to the source object will be copied over to the new object. The problem with that method is that it pastes over, not only the Effects but the style AND the effects. So, if I only want to copy the effects, we should have a Copy/Paste Effects. For example, if I have an object with a red fill and a 4 pt green line and I apply it a drop shadow effect, if I want to copy just the drop shadow to another object that has a gradient fill and no line, it is not possible right now. Yes, it does copy everything. There's no way to separate the object style from the effects applied. We can do that in Photoshop. Would be useful in Designer as well as in Affinity Photo. Probably Publisher could benefict from this as well! 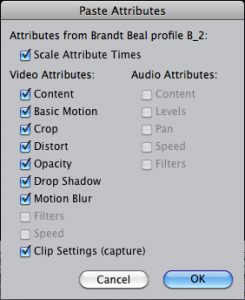 With Premiere and Final Cut there is a "paste special/attributes" function where you can choose which effects you want to paste afterward. Why not something similar? Copying styles would be essential. At the moment I create a user-defined style which then can be applied to other layers, but this is just a quick workaround. I wanted to copy the outer shadow from the blue dude onto the pillow layer. It seems that pasting text-styles is not working (as I would expect). For instance if I copy a text element with a 23pt text size, pasting it to another text element will not apply that size. I would also like to request this feature add. I'm surprised it's not already a feature. This is a pretty essential tool. Photo has a "Paste FX" menu item - has this not made it into Designer yet? Should be easy enough to add if not! It isn't possible in AP and in AD to copy only layer effects, like a shadow effect, from a vector object to other vector forms, it overwrites also the color of the object. Would be nice to see a feature like in PS, where we can copy only effects to other layers. That's a really important function. You're right, there's still a few issues here. I've logged them to be looked at. I've also filled an improvement request to add this to Designer. About this feature, would it be possible to simply Alt-Drag the "fx" icon from a layer to another to duplicate the effect? Also, just moving the "fx" icon should just move the effect to another layer. Photoshop has this feature since a long while. Doesn't work. It shows in the layer column that the effect has been applied but it doesn't show on the object. Sorry to hear that it isn't working for you. I've been using it with the Mac version with no problems (including the latest release but I haven't used it with the last beta yet). Which version are using (Windows or Mac and which release number too)? If you are having problems with it, you should log a bug report in the Bugs thread. I'd like to see this added as well. In Photoshop you could right-click on the FX icon on the layer and choose Copy, Paste or Clear for the layer effects. Clear is also not there as far as I can see. Right now I have to take a screenshot of a layer effect, and then copy them manually to a new layer. Really need this feature. CMO at Kinsta & blogger and co-founder at forgemedia.